The Aurora Borealis isn't just for Scandinavians. The beautiful display might be seen as far south as Iowa and New York on Tuesday. 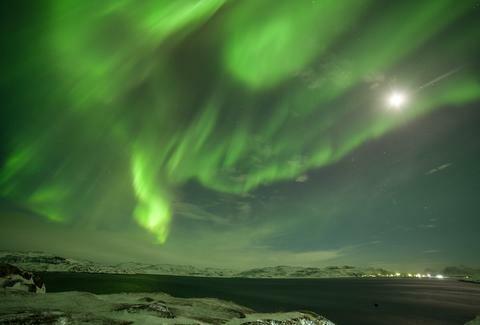 The National Oceanic and Atmospheric Administration's Space Weather Prediction Center is projecting a "moderate" solar storm Tuesday, allowing residents of the Midwest and Northeast the possibility of indulging in a rare glimpse of the phenomenon. The display should be bright and far-reaching because the Earth is being bombarded by fast-particles from the sun. When those charged particles from solar winds hit the Earth's magnetic field it creates the Aurora Borealis. (Rather, when those particles get past the magnetic field and hit the upper atmosphere they start to glow after interacting with neutrally charged oxygen and nitrogen.) The deluge of particles has the potential to make the oval — defining where the Northern Lights can be seen — push further south than it's generally seen, creating a rare opportunity in the northern U.S. The best way to get a glimpse is to get somewhere far from the light pollution of cities and wait. The Northern Lights aren't a constant presence, so it can take a bit. If you're feeling lazy and want to chance it, pay attention to updates from @Aurora_Alerts to get a heads up when the solar storm is at its strongest. It'd be a great night to be sleeping in a glass igloo in the Arctic Circle. If you're not that fortunate, you're still pretty fortunate. The Northern Lights don't often reach this far south. Take advantage of the situation like you're Charlie Bucket and Willy Wonka just left the room.